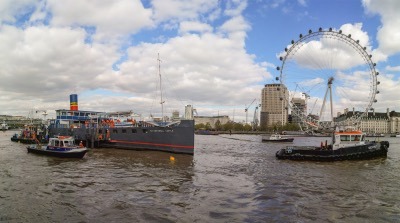 The PS Tattershall Castle was towed upstream on a falling tide to its new berth on Monday. The move comes three months later than planned. The gangplanks will be in place by the end of May when the 556 ton paddle steamer reopens as a floating pub. The PS Tattershall Castle is opposite the London Eye and between Hungerford and Westminster Bridges. Boarding will be from the Victoria Embankment.